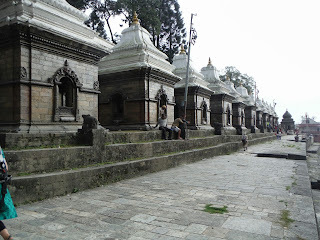 A mistaken taxi ride on took us to Pashupatinath, another World Heritage site, so we stayed to explore. 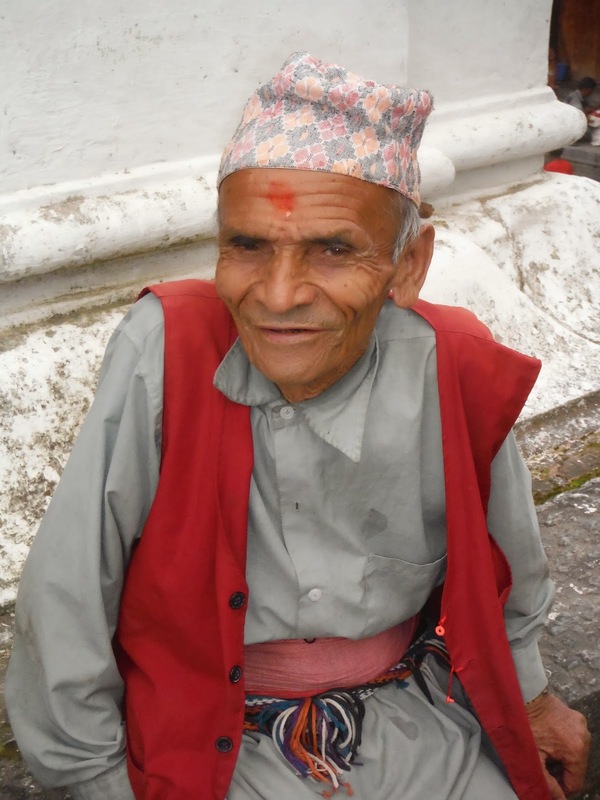 The young guide who befriended us spoke very good English and we learned a great deal that afternoon about the site and the Hindu religion. 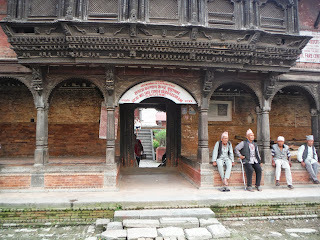 As non-Hindus we were not allowed inside the Temple itself, but there was so much else on the site to see. 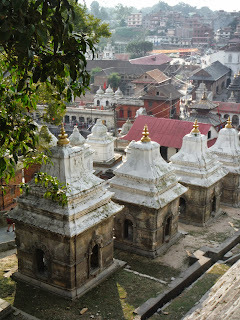 Pashupatinath, (pronounced Pash- patti-nat) is Nepal's most sacred Hindu site and covers a large area on either side of the Bagmati River on the eastern side of Kathmandu. The name come from the God Pashupati who was Lord of the Animals, but the holy site is thought to date from pre-Hindu times, around the third Century BC. Nepali schoolchildren are taught that the God Shiva, to escape his heavenly duties, disguised himself as a one-horned stag and hid in the forest here. Several types of deer are still kept in the deer-park on the hill overlooking the river. 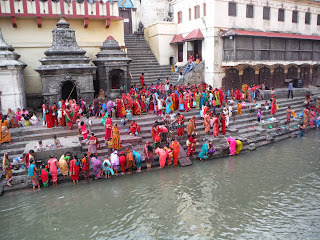 Female pilgrims visit this site from Nepal and Northern India, to bathe in the river water. They do this as they believe it will help a woman to conceive a baby. 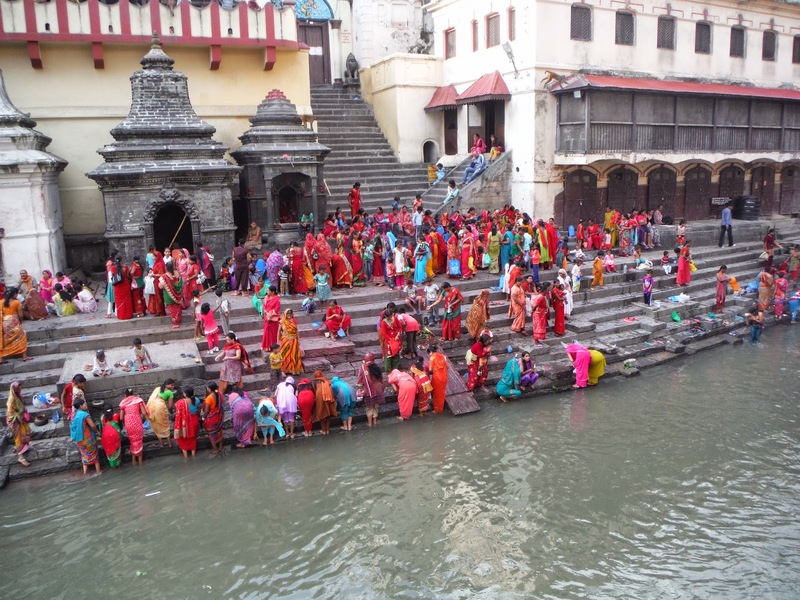 We saw many brightly dressed women pilgrims on the steps leading into the river, paddling and even fully immersed in the water, fully clothed of course as Hindu women are very modest and always cover their bodies. Hindu women bathing in the river. The site is most famous for its gnats, stone platforms where bodies are cremated beside the river, and then the ashes are put into the water. 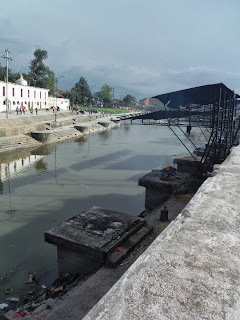 Nepali Hindus believe that to die here in the hospice and be cremated beside the river is extremely holy. When we were there, smoke from the pyres drifted through the surrounding air, and a funeral procession was making its way to the cremation platform. Burning gnats beside the river. 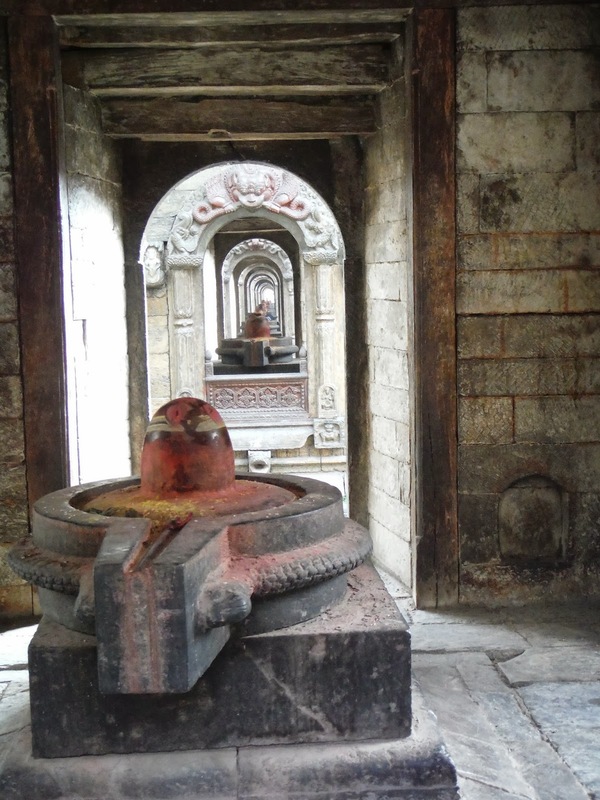 However the site also contains many interesting buildings and monuments, especially dedicated to the God Shiva. This line of 15 Shivalaya buildings is so accurately positioned that you can look through them from one end to the other. 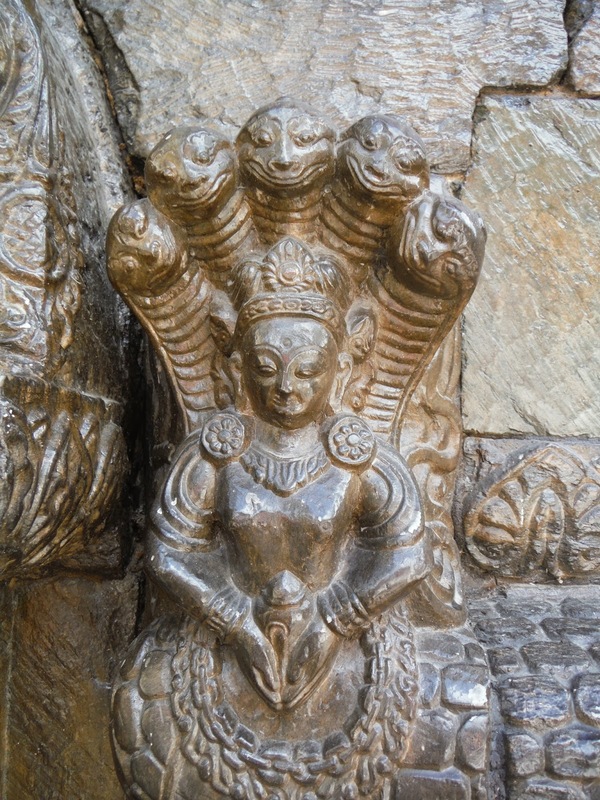 They were built nearly 200 years ago, in remembrance of royal women who committed sati, killing themselves on their husbands funeral pyre. This practise is no longer allowed! Looking through the 15 Shivalaya. 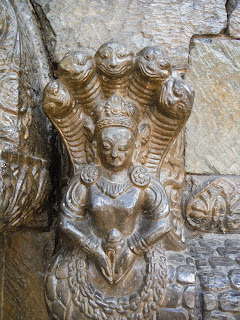 These Shivalaya are beautifully decorated with stone carvings, many depicting Hindu Gods and scenes from stories of the Gods. Close by, Mother Theresa's Missionaries of Charity run a centre for the old. 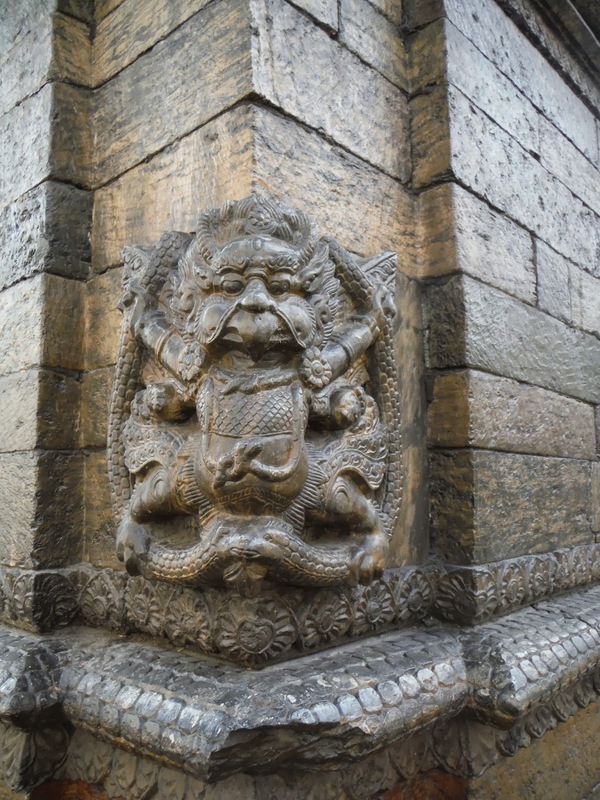 About 250 elderly people are housed around a beautiful old courtyard with a small shrine at it's centre. 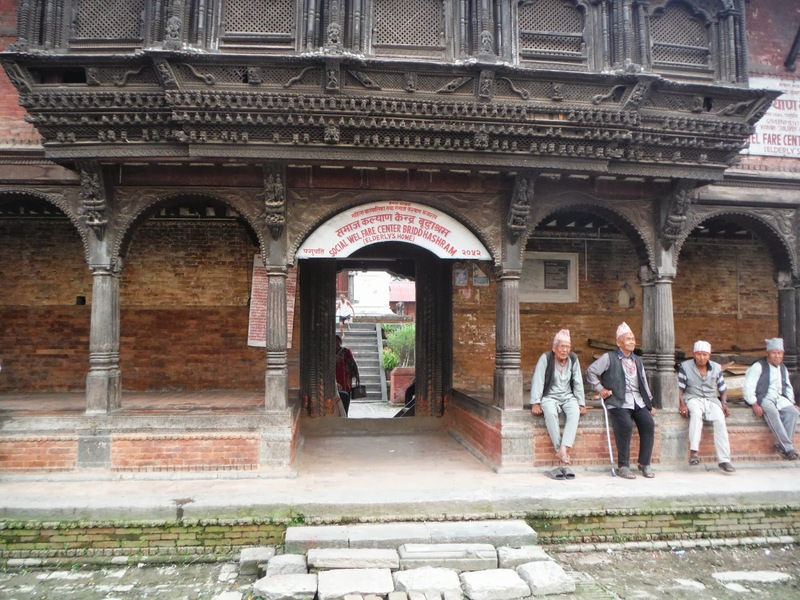 Old men sit in the courtyard. A old man with a lovely expressive face came to sit with us on the stone steps, and was delighted to have his photo taken. 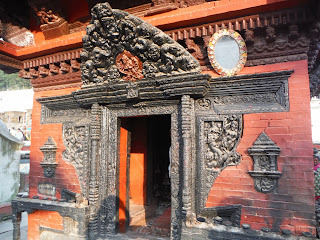 Another fascinating place to visit in the Kathmandu Valley.